Chez Celine is where we love to eat pastries, Carboncitosis where we love to hang for drinks and Mexican food. 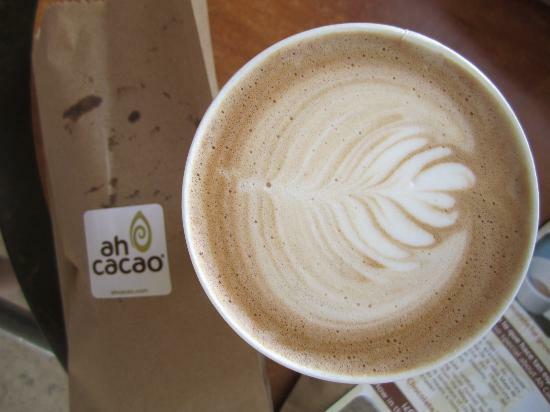 Ah Cacao is where we love, love, love to have coffee and chocolate. Yes, we admit it, coffee and chocolate all in one sitting. It is a midday treat as it seems wrong (?) to have chocolate for breakfast, and coffee can keep us up at night. So our midday treat is more regularly than we care to admit, a fair trade cafe late and some chocolate mouse at Ah Cacao! Coffee plantations are known for not treating or paying their coffee pickers right. Ah Cacao has made sure that they participate with suppliers who DO treat their staff and the planet right. Shade grown, fair trade, and you know what the best coffee we have had. We prefer the cafe lattes, but the espresso, chocolate espresso, American coffee and cappuccino is also fabulous. It is coffee at it best and we know we are dealing with sustainable minded companies. In addition to the sin of coffee, Ah Cacao has great chocolate in many forms. Maybe we should name Ah Cacao the Sin Store as they really do mix some sinfully delicious things together. Where do we start. Chocolate mousse that can not be finished in one sitting it is so rich and so good. Mayan chocolate ice cream that has a hint of cinnamon in the chocolate. Bars of chocolate in white chocolate, milk chocolate and dark chocolate (72%). Chocolate croissants, chocolate cake, and BROWNIES!!! Heavenly, rich, chewy brownies. These brownies are not like cake brownies, these are the real think, googey, rich, mushy and oh so heavenly. Ah Cacao is located on the corner of Constituyentes and 5th Ave or on 30th street and 5th Ave. The walk will justify the the treat be warned, eat their treats in the afternoon or you may be up for a long night. They have chocolate you can take back with you and their coffee as well can be purchased for home use. Like them on Facebook and share your photos with us as the only way to really take in this treat is to share your photos. The best way to experience this treat is to join us in Playa del Carmen and actually eat and drink what Ah Cacao does best, chocolate and coffee.